An efficient and accurate contour integration method is presented for large-scale electronic structure calculations based on the Green function. By introducing a continued fraction representation of the Fermi-Dirac function derived from a hypergeometric function, the Matsubara summation is generalized with respect to distribution of poles so that the integration of the Green function can converge rapidly. Numerical illustrations, evaluation of the density matrix for a simple model Green function and a total energy calculation for aluminum bulk within density functional theory, clearly show that the method provides remarkable convergence with a small number of poles, indicating that the method can be applied to not only the electronic structure calculations, but also a wide variety of problems. The integration of the Green function associated with the Fermi-Dirac function is one of the most important ingredients for accurate and efficient implementation of electronic structure calculation methods regardless of ab initio or semi-empirical schemes. One can realize that the integration arises in lots of electronic structure calculation methods such as the Korringa-Kohn-Rostoker (KKR) Green function method,[1,2,3] Green function based O( ) methods such as a recursion method,[4,5] a surface Green function method such as an embedded method, and Green function methods based on a many body perturbation theory such as the GW method. [8,9] Therefore, it is obvious that a highly accurate and efficient method must be developed for the integration to extend applicability of these electronic structure calculation methods. Since the well-known Matsubara summation [15,16] is insufficient for this purpose due to the slow convergence, considerable efforts have been devoted for development of efficient integration methods. [10,11,12,13,14] A way of developing an efficient method beyond the Matsubara summation is to seek another expression for the Fermi-Dirac function. 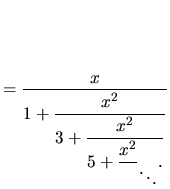 Along this line, an expression is used by Nicholson et al., and an integral representation is proposed by Goedecker. In this paper I seek a different expression for the Fermi-Dirac function, and present an accurate and efficient method for the integration, based on a continued fraction representation of the Fermi-Dirac function which is derived from a hypergeometric function. Because of a simple distribution of poles in the continued fraction similar to the Matsubara poles, it is anticipated that the proposed method can be easily incorporated into many applications with the same procedure as for the Matsubara summation but with remarkable efficiency. It will be shown that the rapid convergence in the integration can be attributed to an interesting non-uniform distribution of the poles on the imaginary axis, and that even a small number of poles in the contour integration enables us to achieve convergent results with precision of more than ten digits. This paper is organized as follows: In Sec. II the theory of the proposed method is presented with comparison to other methods. In Sec. III in order to illustrate the rapid convergence properties of the proposed method I give two numerical examples: a calculation of the density matrix for a simple model Green function and a total energy calculation of aluminum bulk within a density functional theory. In Sec. IV the theory and applicability of the proposed method are summarized. The expression becomes exact in case of the limit: . Noting that and is an odd function, it is found that the poles are symmetrically located on the complex plane with respect to the real axis. Furthermore, it will be shown in later discussion that the poles are located on only the imaginary axis and that the residues are real numbers. Thus, note that is a real number in Eq. (3). In case of an odd number of , an additional term which is proportional to is added to Eq. (3), and I will not discuss the odd case in this paper. one can find that the residue in Eq. (3) is a real number, where and appearing in the first line of Eq. (11) are due to the symmetry of . Thus, the poles and residues in Eq. (1) can be easily obtained by solving the eigenvalue problem with the real symmetric matrices and without any numerical difficulty. with the poles and the residues . This relation Eq. (12) can be derived by taking account of Eq. (A10) and the Mittag-Leffler expansion  for . Therefore, one may think that their convergence properties should be comparable to each other. 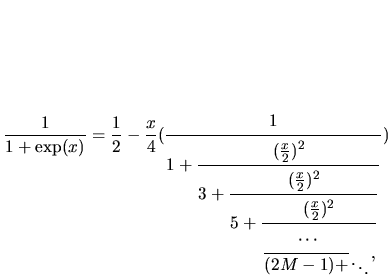 However, it will be shown later that the continued fraction representation by Eq. (1) provides a remarkable convergence speed compared to the Matsubara summation. 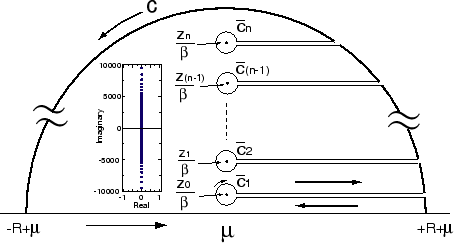 The roots of the rapid convergence lies on an interesting non-uniform distribution of the poles on the imaginary axis. It is observed from Fig. 3 that in case of the interval between neighboring poles of Eq. 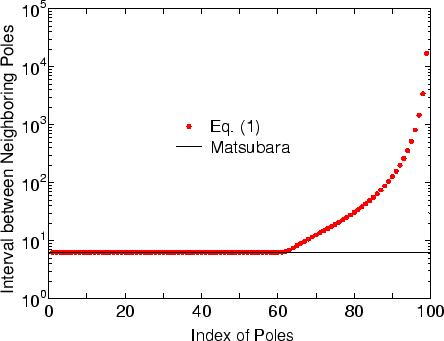 (1) are uniformly located up to around 61th poles with the same interval as that of the Matsubara poles, and from then onward it increases very rapidly as the distance between the pole and the real axis increases, while the Matsubara poles distribute uniformly on the imaginary axis everywhere. The distribution of the poles seems to be almost independent of the number of poles , provided that the pole index is normalized by the number of poles on the upper half complex plane, i.e., the interval starts to increase rapidly at about 61 % of the total number of poles . The sparse distribution of poles of Eq. (1) in the faraway region from the real axis well matches the fact that the Green function becomes a smooth function, while going away from the real axis, and by covering a wide range of the imaginary axis with a small number of poles, the continued fraction representation Eq. (1) can reproduce very well the Fermi-Dirac function on the real axis as shown in Fig. 1. The property is the reason why Eq. (1) is much superior to the Matsubara summation for the integration of the Green function. where is a large real number and 1.0e+10 is used in this study. Therefore, one can see that just one evaluation of the Green function yields the zeroth order moment . In Eq. (13) the integration on the real axis is transformed into a quadrature on an axis perpendicular to the real axis with the characteristic distribution of the poles except for the evaluation of the zeroth moment . Thus, it is reasonable to anticipate that the density matrix evaluated by Eq. (13) quickly converges as a function of the number of poles, since the Green function becomes structureless by going away from own poles located on the real axis. where are large complex numbers, and can be given by with a large , while they can be chosen arbitrarily only if is large enough so that the higher order terms can be negligible. Thus, one can see that the general density matrix is evaluated by the proposed method as well as the conventional density matrix. In the Appendix C the integrations of the Green function with the derivative of the Fermi-Dirac function with respect to energy are discussed. To demonstrate the rapid convergence of the proposed method I give two numerical examples, (i) calculation of the density matrix for a simple model Green function and (ii) a total energy calculation of aluminum bulk in the face centered cubic (FCC) structure within the Harris density functional. where the unit of energy is in eV. It is assumed that the chemical potential is 0 eV and that the electronic temperature is 300 K. Table I show the density matrix calculated by three method: the proposed method through Eq. (13), the method discussed in Ref. , and the Matsubara summation. We see that the density matrix calculated by the proposed method rapidly converges at the analytic value (3.0) using only 40 poles, while the convergence speed by the second method is about three times slower than that of the proposed method. Also, the stepwise improvement of the density matrix in the second method is attributed to the plunge step of the approximate function used in the method in the lower energy region as shown in Fig. 1. 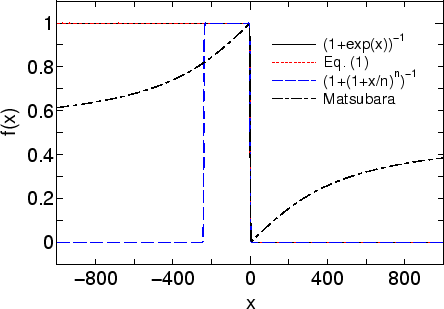 It is also confirmed that the convergence of the Matsubara summation is quite slow. As well as the simple model, I show in Table II the convergence of the total energy calculated by the recursion method  with the Harris functional for FCC aluminum as a function of the number of poles. In this calculation I use pseudo-atomic double valence numerical functions as basis set, a norm-conserving pseudopotential, and a generalized gradient approximation (GGA) to the exchange-correlation potential. The Green function is evaluated by the recursion method with ten recursion levels. Also, an electronic temperature of 600 K is used. The DFT calculation was done using the OpenMX code. As shown in Table II, it is obvious that the proposed method provides remarkable rapid convergence. The use of only 80 poles yields the convergent result of 14 digits which corresponds to the limit of double precision. On the other hand, it turns out that the second and third methods are much slower than the proposed method, and that the full convergence is not achieved even in case of ten thousands poles. It is also worth mentioning that the proposed method can be applicable to insulators and semi-conductors as well as metallic systems without depending the magnitude of band gap in a system if the Fermi energy is determined so that the total number of electrons in the whole system can be conserved. I have developed an efficient contour integration method for electronic structure calculation methods based on the Green function. By introducing a continued fraction representation of the Fermi-Dirac function, the integration of Green function with the Fermi-Dirac function on the real axis is transformed into a quadrature on an axis perpendicular to the real axis except for the evaluation of the moments. Although the feature is similar to that of the Matsubara summation, the most important distinction between those lies on the distribution of poles. The poles of the continued fraction distribute uniformly on an axis perpendicular to the real axis with the same interval as the Matsubara poles up to about 61 % of the total number of poles, and from then onward the interval between neighboring poles increases rapidly as the poles go away from the real axis, while the Matsubara poles are uniformly located on an axis perpendicular to the real axis. The characteristic distribution of poles in the continued fraction well matches the smoothness of the Green function in the distant region from the real axis, and therefore enables us to achieve the remarkable convergence using a small number of poles. The numerical examples clearly demonstrate the computational efficiency and accuracy of the proposed method. Since the contour integration by the continued fraction representation can be regarded as a natural generalization of the Matsubara summation with respect to the distribution of poles, it is anticipated that the proposed method can be applied to not only the electronic structure calculation methods, but also many other applications. The author was partly supported by CREST-JST and the Next Generation Super Computing Project, Nanoscience Program, MEXT, Japan. Inserting Eq. (A9) into Eq. (A10) yields the continued fraction representation Eq. (1) of the Fermi-Dirac function. Thus, we see that from the Green function defined by Eq. (B1) the density matrix can be easily evaluated using the proposed method, since and are computed in the same way as for Eq. (13) by considering the contour integrals in the upper and lower complex planes, respectively. one has to include contributions of the derivative of the Green function with respect to energy which can be evaluated through a response function calculated from the Green functions. J. Korringa, Physica 13, 392 (1947). W. Kohn and N. Rostoker, Phys. Rev. 94, 1111 (1954). N. Papanikolaou, R. Zeller, and P. H. Dederichs, J. Phys. : Condens. Matter 14, 2799 (2002). R. Haydock, V. Heine, and M.J. Kelly, J. Phys. C 5, 2845 (1972); 8, 2591 (1975); R. Haydock, Solid State Phys. 35, 216 (1980). J. Inglesfield, J. Phys. C 14, 3795 (1981). L. Hedin, Phys. Rev. A 139, 796 (1965). D.M.C. Nicholson, G.M. Stocks, Y. Wang, W.A. Shelton, Z. Szotek, and W.M. Temmerman, Phys. Rev. B 50, 14686 (1994). V. Drchal, J. Kudrnovský, P. Bruno, I. Turek, P.H. Dederichs, and P. Weinberger, Phys. Rev. B 60, 9588 (1999). F. Gagel, J. Comput. Phys. 139, 399 (1998). G. D. Mahan, Many Particle Physics, (Plenum, New York, 1981). In addition to Eq. (1), I investigated the convergence properties of other continued fraction representations of the Fermi-Dirac function, which are given in Ref. , and it turned out that Eq. 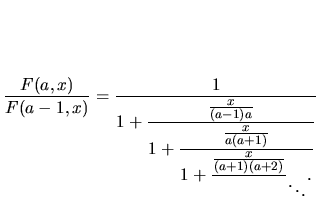 (1) is the best convergent approximant among these continued fraction representations. 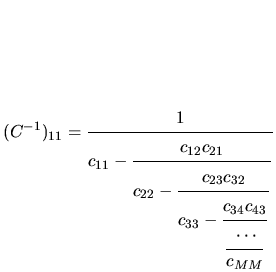 However, there is a possibility of further improvement for the convergence of the continued fraction representation, e.g., a continued fraction derived from a multipoints Padé approximant. L. Lorentzen and H. Waadeland, Continued Fractions with Applications, Amsterdam, Netherlands: North-Holland, 1992. Although the rigorous proof remains unavailable, I confirmed validity of the statement for the cases up to by MATHEMATICA. Consider an eigenvalue problem having the same eigenvalues and eigenvectors as for , where and . Noting that is positive definite, the eigenvalue problem can be transformed into , where is a diagonal matrix of which diagonal elements are the inverse of square root of the corresponding diagonal element of , and . If the dimension of is an even number , the determinant of is , while it is zero in case of an odd number, in this case is a well defined real symmetric matrix. Thus, it is found that the eigenvalues and eigenvectors of are purely real, provided that the dimension of is an even number . Tables for the poles and residues, and a program code of generating those are freely available on a web site (http://staff.aist.go.jp/t-ozaki/) under the term of GNU-GPL. I.S. Gradshtein, I.M. Ryzhik, Table of integrals, series, and products, A. Jeffrey, Ed. (Academic Press, New York, 1980). J. Harris, Phys. Rev. B 31, 1770 (1985). T. Ozaki, Phys. Rev. B. 67, 155108 (2003); T. Ozaki and H. Kino, ibid. 69, 195113 (2004). Table: The density matrix of a model Green function given by Eq. (24) as a function of the number of poles in the upper half plane used in three contour integration methods. The analytic value is 3.0. Table: The total energy (Hartree) of FCC aluminum bulk calculated by the recursion method with the Harris functional as a function of the number of poles in the upper half plane used in three contour integration methods, where the electronic temperature is 600 (K) corresponding to a smearing of 0.052 (eV). It is noted that the width of the valence band consisting of and orbitals up to the Fermi level is about 10 (eV). Figure: (Color online) The Fermi-Dirac function and its approximants as a function of the real axis . For substantial comparison all the approximants possess the same number of poles, 120 poles. Figure: The path of the contour integration associated with Eq. (1). The inset shows the distribution of zero points of Eq. (1). Figure: (Color online) The interval between neighboring poles of Eq. (1) terminated at as a function of an index of poles, where the index of poles is determined in ascending order with respect to the absolute value of poles. The interval for the Matsubara poles is .